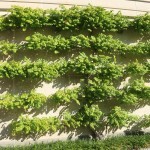 This is a vigorous climbing plant with dark green leaves that turn golden yellow in fall. 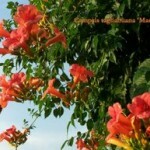 The large trumpet shaped flowers are salmon red to orange-red, starting in spring through early fall. The flowers are attractive to hummingbirds. It tolerates a range of soils, as long as it is a well-drained site. 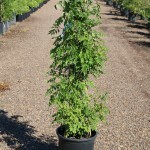 It is drought tolerant once established, but some summer watering will promote flowering. Prune as needed when dormant.